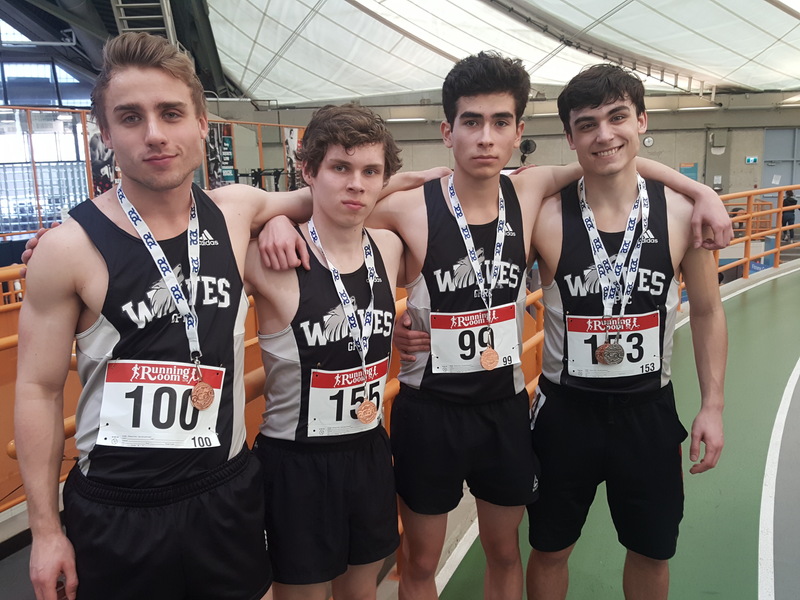 A pair of medals from Brandon Tufford and the Men’s 4 x 400m team highlighted a stellar performance from the Wolves tracksters at the 2019 ACAC Indoor Track Championships in Calgary on the weekend. Tufford broke his own school record in the 600m recording a time of 1:23.63. He finished less than a second behind ACAC record holder Brent Stephen from SAIT. Tufford also placed fifth in the Men’s 300m. In addition, he combined with Joel Manz, Miguel Macedo, and Brice Wilkes to win the bronze medal in the 4 x 400m relay. Joel Manz, Brice Wilkes, Miguel Macedo, and Brandon Tufford shattered the school record by 5 seconds in the 4 x 400m relay at the 2019 ACAC Indoor Track Championships. The quartet recorded a time of 3:38, good for 3rd place. Collectively, the Wolves women placed 4th in the team standings with 18 points. The men were the fifth place team scoring 33 points, only 3 points shy of the bronze medal. In 2018, both teams placed 6th scoring 6 and 12 points respectively. 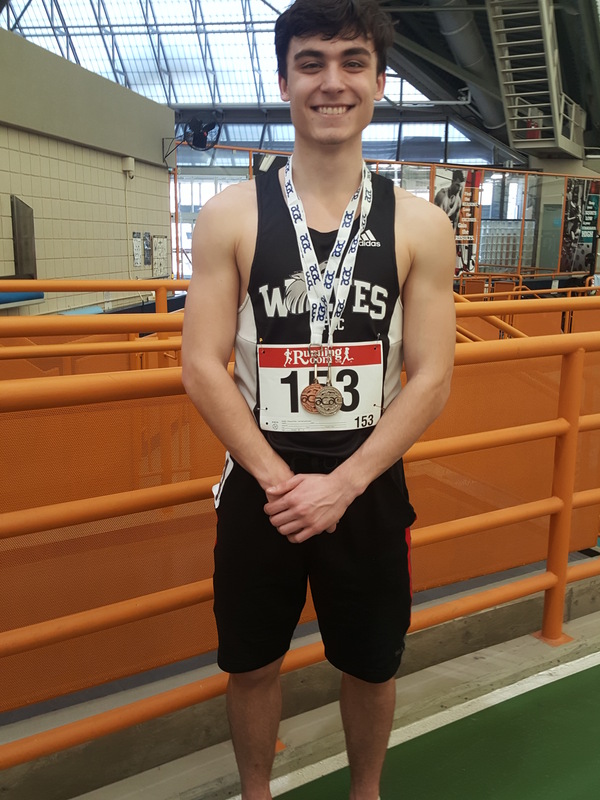 Wolves Athletics club athlete Kobe Grocholski parlayed a massive personal best time in the 1000m into a third place finish at the Athletics Alberta Provincial Indoor Track and Field Championships in Edmonton on Saturday. Grocholski stopped the clock in 2:37.29, 13 seconds better than his previous best time for the distance. On Sunday, Grocholski upgraded his placing to second in the U18 Men’s 1500m. He clocked a time of 4:17. Team mate Chris Nelissen also took part in the meet on Sunday, recording time of 38.27 for the U20 300m (15th place) and 4:38 for the U20 1500m. 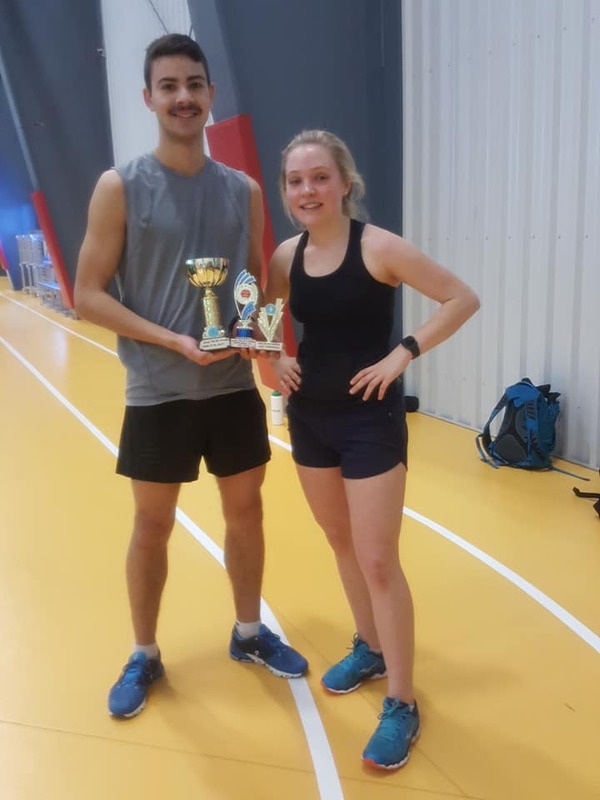 Several members of the GPRC Wolves Indoor Track team tuned up for next week’s provincial college championships by contesting the always competitive Amanda D Hippy Open at the Crosslink Sportsplex on Saturday. Brandon Tufford broke his own facility record in the 400m by clocking a time of 56.7. He was chased to the line by Joel Manz who ran 57.1. Maria Houle was the top female runner in the 400m, recording a time 70.1. In the 2000m, Miguel Macedo established an early lead and never looked back. He stopped the clock at 6:43.3, seven seconds better than 4-time SRRA Male Athlete of the Year Eric Nooy. The 800m was won by Taylor Hudak in a time of 2:30. Anna van der Geissen (2:47.7) placed first among the women. In a bold coaching move, Anna van der Geissen was added to the GPRC “Men’s” 4 x 400m B team. She anchored the team to a 2nd place finish in the B heat in a time of 4:04.70. Rookie sensation Brandon Tufford tore up the track Saturday at ACAC Indoor Track Meet #2 – The Concordia Open on Saturday in Edmonton. Tufford established two new individual school records (300m – 37.05 – 3rd place) and (800m- 1:58.98 – 2nd place). In addition, he combined with teammates Miguel Macedo, Brice Wilkes, and Joelmanz to establish a new GPRC’s 4 x 400m record (3:41.95 – 2nd place). Second year runner Anna van der Geissen was the other Wolves athlete to achieve a podium placing at the meet. She established a new personal best time 1:46.59 in the 600m, good for 2nd place. In the corrected Men’s team standings, the Wolves placed second with 44 points, three points behind the victorious Concordia University of Edmonton. With only two athletes competing, GPRC placed ninth in the Women’s team standing. Next up for the Wolves tracksters is the ACAC Indoor Track Championships on March 15 and 16 in Calgary. It may have been -39C outside, but the track inside was smoking on Saturday morning at the Crosslink Sportsplex where the 2019 Lydia’s Day Off Invitational was taking place. Brandon Tufford from the host GPRC Wolves club blasted the fastest 400m ever run in Clairmont, stopping the clock at 57.0. He was chased the whole way by teammate Joelmanz, who recorded at time of 58.0. In the 1000m, Chris Nelissen unleashed a fierce kick over the last 200m and ran down Kobe Grocholski for the win. Nelissen’s time was 2:50.8, 1.5 seconds faster than Grocholski. Anna van der Geissen had the fastest women’s time in the 1000m (3:42.8). The 2000m saw a fierce 3-way between Miguel Macedo, Brice Wilkes, and the ageless Fabio Minozzo. In the end, Macedo prevailed in a time 6:41.3. The meet concluded with a controversial 4 x 200m relay. The top two teams, Wolves International and Wolves Sketchy were disqualified for a variety of questionable infractions. Wolves Classic, featuring the ultimate classic, Rick Scott, was declared the winner of the relay. Full results of the LDO Invitational are posted here. Miguel Macedo set a school record of 2:47 in the 1000m at the 2019 MacEwan Open in Edmonton. 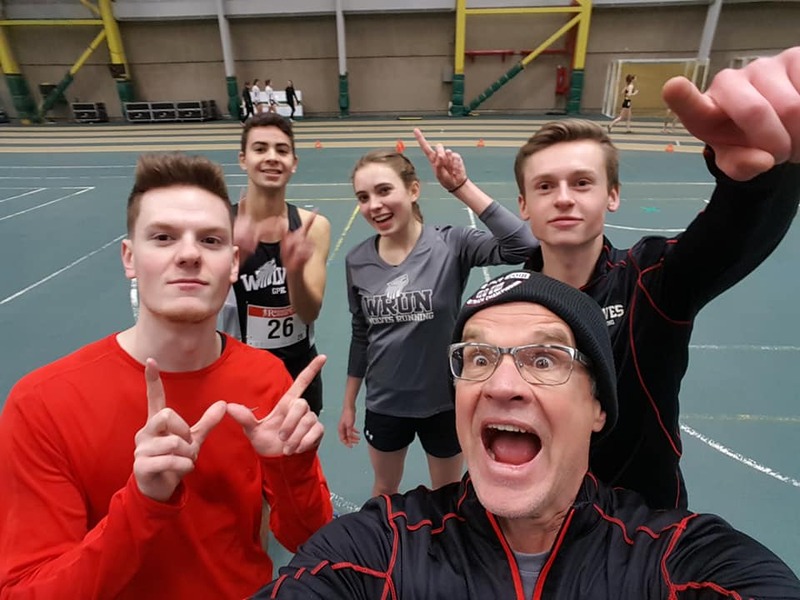 The GPRC Wolves Men’s Indoor Track team had a historic day on Saturday, setting three new school records at ACAC #1 – The MacEwan Open in Edmonton. Rookie Miguel Macedo was the first GPRC athlete to revise the record book, recording a huge personal best time of 2:47.10 in the 1000m, good for 3rd place. Macedo took 3 seconds off Hayden Hollowell’s 2012 Wolves standard for the 1000m. Brandon Tufford cruised to the win in the men’s 600m in a time of 1:24.86. Tufford’s run broke Joren Manz’s 2013 Wolves record by 1 second. Joelmanz leads off the Wolves 4 x 400m team at the 2019 MacEwan Open. The team established a new school of 3:45, finishing second to the host team. In the 4 x 400m relay, the squad of Tufford, Macedo, Brice Wilkes, and Joel Manz, finished second to MacEwan University, but the Wolves time of 3:45.67, sliced 5 seconds off of the 2011 school record of 3:50. The GPRC women also had some strong performances. Anna van der Geissen placed second in the women’s 1000m in 3:19.44, and Maria Houle was 4th in the 600m in 1:48.68. The women’s 4 x 400m team of van der Giessen, Houle, Krista Frey, and Brittany Duvall finished 3rd. Collectively, the Wolves men placed third in the team standings, while the women were 4th. Next up for Wolves Indoor Track team is ACAC #2 – The Concordia Open in Edmonton on March 2. Rick Scott (left) stops the time in the Men’s 300m at the 2019 Rick Scott Open. Chris Nelissen’s shoulder edged out JoelManz (no space – say it as a single word) for the win. Wolves Athletics Club superstar Chris Nelissen parlayed two wins, including a meet record, into an unprecedented third Male of Athlete of the Meet title at the 2019 Rick Scott Open at the Crosslink Sportsplex on Saturday. Nelissen outleaned Brandon Tufford in the 800m, stopping the clock in 2:10.4, a mere tenth of a second off of Tufford’s 2018 meet record. Nelissen returned 30 minutes later and won the 300m in a meet record time of 41.6. 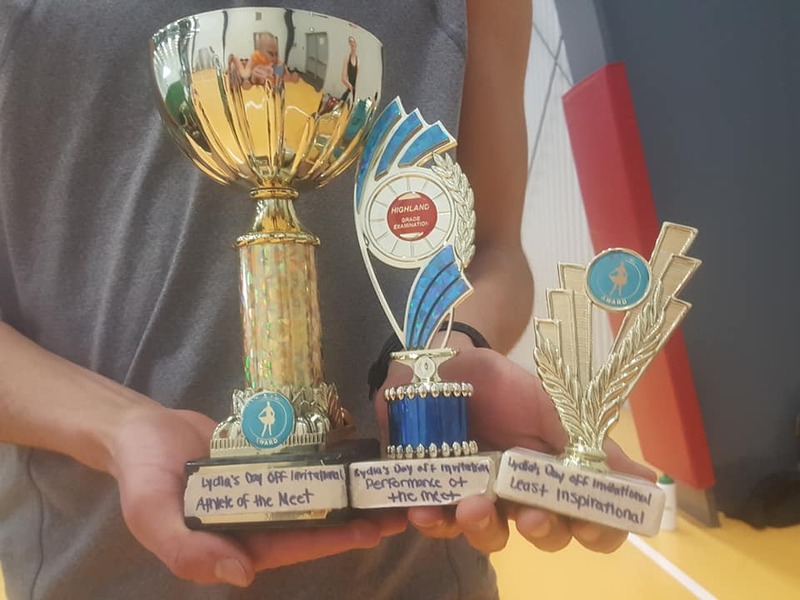 Women’s Athlete of the Meet Anna van der Geissen was equally as impressive. She also won the 800m and 300m, clocking times of 2:49.6 and 53.5. Maria Houle was awarded the Outstanding Inspirational Performance of the Meet for a turning in a stellar leg third leg on the 4 x 100m that vaulted her squad, Joel’s Team, to victory in a time of 60.1. Trophy winners and Participation Ribbon recipients show off their spoils from the 2019 Rick Scott Open. Second-year runners Eric Nooy and Anna van der Giessen returned to the CCAA Cross Country Running Championships on Saturday, and both made significant improvements over their 2017 placings. Nooy, running in the men’s 8 km race, clocked a time of 30:49 and recorded a 59th place finish, 39 spots better than last year. Van der Giessen had similar success in the women’s 6 km race. She crossed the line in 45th place (vs. 72nd place in 2017). Collectively, the Wolves women placed 18th among the college teams; the Wolves men placed 19th. Fourteen years after his dramatic upset win at the 2004 CCAA XC Running Championships, Wolves runner Kyle Reynolds is hanging up his spikes. The 32 year old Reynolds placed 42nd on Saturday (6th best amongst his Wolves team mates) at the 2018 ACAC XC Running Championships in Vermilion, clocking at time of 35:04 for the hilly 8 km track. Reynolds, one of only two vets on a rookie-ladden Wolves men squad, has chosen not to accompany his team mates to CCAA Nationals in two weeks time in Toronto. “It’s time to give some of the young guys a chance to run at Nationals,” said Reynolds. Overall, Wolves coach Bill Corcoran described the Wolves’ performance on Saturday as “mixed.” “We improved our ACAC women’s ranking from 7th to 6th, and our men held in there at 6th place, but quite frankly, we were hoping for a few spots better,” explained Corcoran. Anna van der Geissen and Maria Houle led the Wolves women, placing 15th and 16th respectively in the 6 km race. Ashley Camsell (27th) and Brittany Duvall (32nd) were the other two scoring runners for GPRC. Lethbridge College edged out Red Deer College for the women’s team title. Both teams tied at 30 points, but Lethbridge’s fourth runner Janelle Graham ran down Red Deer’s fourth runner in the final few metres to secure the tie breaker. Lethbridge’s Sophia Nowicki won the women’s individual gold medal in a time of 23:53, 25 seconds better than runner up Emily Mann from SAIT. In the men’s race, Eric Nooy (12th) and Miguel Macedo (18th) were the top Wolves finishers. Brandon Tufford ran in the top 10 for the first 5 km of the race, but encountered some severe GI issues in the final few kms and faded to 29th place at the finish, one place better than team mate Brice Wilkes. Placing four runners in the top 7, the #1 CCAA ranked SAIT Trojans dominated the men’s team standings to win their third consecutive ACAC championship. SAIT’s Matt Travaglini defended his 2017 individual crown, with a decisive 20 second victory over Concordia University of Edmonton runner Leonard Chesoo. Both Wolves teams have accepted the ACAC #5 berths for the November 10 2018 CCAA XC Running Nationals in Toronto at Seneca College’s King City Campus. The Wolves will host the 2019 CCAA XC Running Nationals in Muskoseepi Park next year on the November long weekend. Full results are posted at the Race Pro Timing website. With a pair of top six finishes, NW Zone runners recorded the best provincial results in several years at the 2018 ASAA Provincial High School Cross Country Running Championships in Vermilion on Saturday. High Level’s Faith Blanchette led the way, winning the silver medal in Intermediate Women’s race. Blanchette stopped the clock at 20:12 for the challenging 5 km course, 31 seconds behind winner Chloe Palmer of Edmonton. Beaverlodge’s Kobe Grocholoski improved eight spots from his 2017 Provincials finish, and placed sixth in the Intermediate Men’s 5 km run. Grocholoski’s time was 17:31. 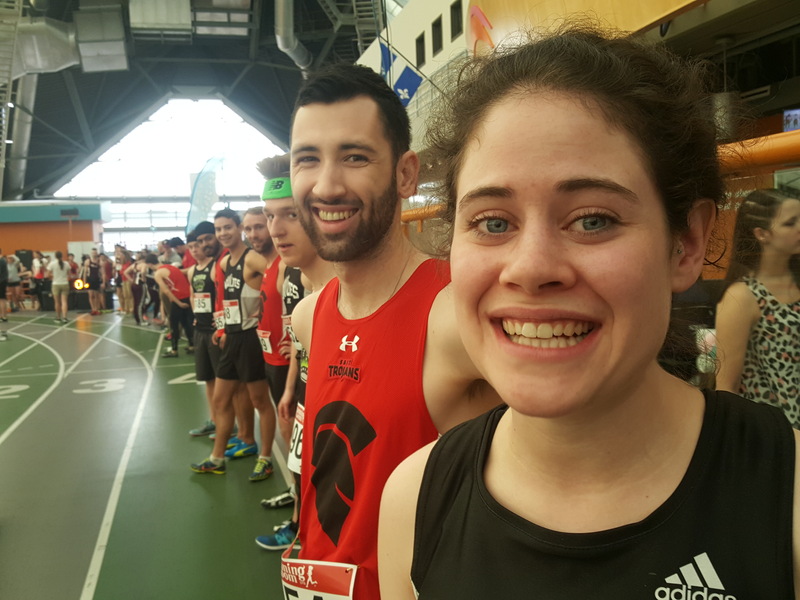 Other NW Zone runners finishing in the top 25 included Peace Wapiti’s Jordan Lundstrom (Senior Men’s 6 km – 13th), LaCrete’s Kyle Fehr (Senior Men’s 6 km – 25th), and LaCrete’s Lindsay Martens (Senior Women’s 5 km – 21st). Full results are available at the Results Canada site.